HIGH Oh my god, I can keep gathering by holding down the button! LOW I’ve made all of these weapons and armors multiple times before. WTF Why are there so many awful collection quests? I’m a guy who loves Monster Hunter. I have a wall full of plastic figures, several t-shirts, a herd of stuffed animals, miniature taxidermy trophies, replica weapons, and a slew of other paraphernalia showcasing my devotion to the series. I’ve spent well over a thousand hours on the games released domestically (probably not far from two thousand, honestly) and I even bought a second WiiU so that I could do multiplayer with my wife. I am in the Monster Hunter camp. I am a fan. On the other hand, I am also a critic who loves games that push themselves forward. I like innovation and improvement. I like fresh ideas, creative spins on existing formulas and being set loose into a title to explore horizons I haven’t seen. I like new. In light of these leanings, I can’t help but be a bit disappointed with Monster Hunter Generations. As an almost-everything-in-one mega-compilation of previous MH entries, there’s a lot of stuff in here that’s genuinely great. The problem? Not much of this is new to me. I’ve played the older games, I’ve made the armors, I’ve fought the monsters, and considering that Monster Hunter 4 Ultimate came out just last year, it’s all so recent that I haven’t missed it. People who’ve spent less time with the series (or those who don’t mind jumping back in so soon) will likely have a different take, but I didn’t feel the call of the wild this time. 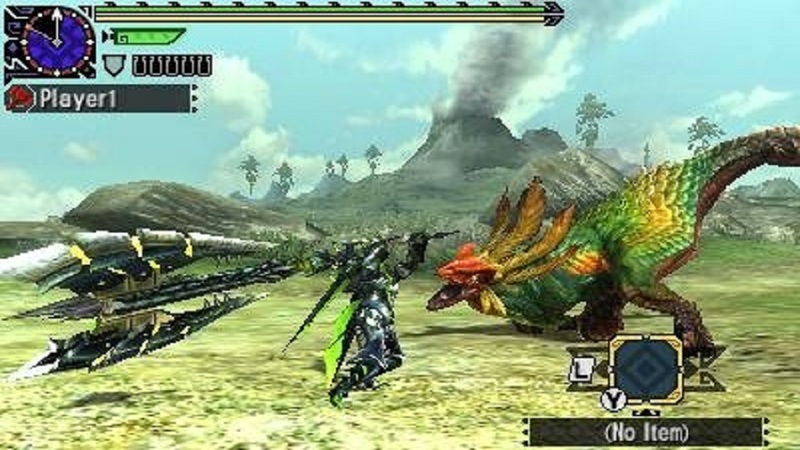 For those new to the franchise, Monster Hunter is a third-person, real-time action game where the player creates a custom character and then goes into a world populated by giant beasts. However, it’s not just swinging swords and firing bows. In addition to the incredibly deep, precise combat, there’s also heavy emphasis on resource collection. Plants, fish and minerals can be harvested from the environment, and players will use the skins, teeth and fur carved from felled monsters to create stronger weapons and better gear to defeat even tougher creatures. Generations offers a new singleplayer story mode, but the game is heavily slanted towards grouping up with a maximum of three others. As I suggested earlier, most of the content here will be instantly familiar to people with hunting experience under their belts, but there have been some new things added to the mix. Some of the UI and menus are different, some of the systems have been tweaked or revamped in some way, values have been rebalanced, and so on… A million little things have been polished or revisited. On a larger scale, notable bullet points include new monsters, new combat styles, and the ability to be one of the cat sidekicks that have been a series staple for years. So how are new monsters? No clue. I hate to say it, but in the 28 hours I spent in the campaign, I only saw one. The tail-bouncing Maccao makes an early appearance, but once past that, I only saw things I’d already killed before many, many times. I was dying to discover more fresh predators, but apparently they’re all much deeper in the game—a shame, since battling new foes might have kept me hooked longer. The new styles of combat are nice additions. Two styles are more or less what players already know, one grants the ability to hop onto monster’s backs without needing a ledge, and the last enables a rushing counterattack if the player manages to dodge at just the right moment. The player can also equip new special moves that activate once a meter is charged—some special attacks, some escapes, some utility moves, and more. It’s neat to have, and a certain contingent will really dig into these. Oh, and being a cat instead of a human hunter? They have several differences in structure (they don’t use items, they don’t have a stamina meter, and so on) and Generations offers missions that can only be completed by these ferocious felines. Testing this mode was a treat, and something fans have wanted for quite some time. However, once the novelty of being a cat wore off and I got back into the game proper, it just couldn’t hold me. Beyond an intense feeling of been-there, done-that, there’s no denying that Monster Hunter Generations is pushing the 3DS to its limit. Camera issues are still present due to the 3DS’s design, it runs worse than 4 Ultimate did thanks to longer and more frequent loadtimes, and because it re-uses so many assets from its predecessor, it doesn’t look any better. This is a sprawling adventure with exotic weapons, colorfully detailed armor, and rampaging wildlife that should be stunning to behold, yet it’s squinty, muddy and rough. This content is screaming out for more robust hardware. Ironically, despite being a bigger package with some improvements (endless thanks to whoever finally enabled continuous gathering by holding down a button) I’d say that Generations is less friendly and coherent to new players than 4 Ultimate. It would be easy to imagine someone getting absolutely lost in a wave of dull-as-dirt harvesting quests and being subdued by tedium before getting to the exciting parts, and it doesn’t help that most of the supporting systems like sending cats on expeditions (yes, really) or dealing with Scraps aren’t intuitive or clear. There’s almost too much content here, and it feels a bit haphazard and scattered. Disclosures: This game is developed by Capcom and published by Capcom. It is currently available on 3DS. This copy of the game was obtained via publisher and reviewed on the standard, non-nub 3DS. Approximately 28 hours of play were devoted to the single-player mode, and the game was not completed. Four additional hours were spent in multiplayer mode. Parents: According to the ESRB, this game is rated T and contains blood, crude humor, fantasy violence and mild suggestive themes. Despite all the warnings, this stuff is totally safe, in my view. The violence isn’t very graphic, consisting of weapons being swung and monsters or hunters getting knocked around, but no real blood or gore is ever shown. As for the humor or suggestive themes, it’s couched in dialogue with no graphic visual component. Super safe for kids old enough to manage the gameplay. Deaf & Hard of Hearing: All dialogue is subtitled and there are no auditory cues needed for gameplay. I spent most of my time with the sound totally off and had no problems. Remappable Controls: Certain functions can be altered between presets and axes can be flipped and so forth, but the controls can’t be freely remapped.